One of my favourite places to find new recipes are at my friends’ houses -digging through their cookbooks is like unlocking a treasure trove of foodie goodness. One of my closest friends, Jess, lives in Calgary so I don’t have the opportunity to dig through her cookbook. She blogs regularly over at Cooking In My Genes, and her blog is full of delicious recipes. Every time I visit Jess, I come home with at least one new recipe to throw into my dinner recipe standards. Since, I can’t pore over her cookbook, she’s doing the next best thing…guest posting on my blog for Tasty Tuesday! Without further ado….here’s Jess! Hey everyone! Today I’m taking over Bawlers & Crawlers with an easy & delicious dinner recipe! Steph and I have been friends since high-school and now find ourselves both blog-writing up a storm so she asked me to come on over with a weeknight dinner recipe for you. My name is Jess and I write about food, family & foodie adventures over on my blog, Cooking in my Genes. My love of food started at a young age and these days I cook and bake for those I love; to me there’s nothing better than the people I love, sitting around a table, enjoying a meal together. I have fond memories of Steph making us ‘bruschetta bagels’ in our university days and those same flavours inspired this recipe. I hope this delicious and quick dinner recipe makes its way onto your dinner table in the future! 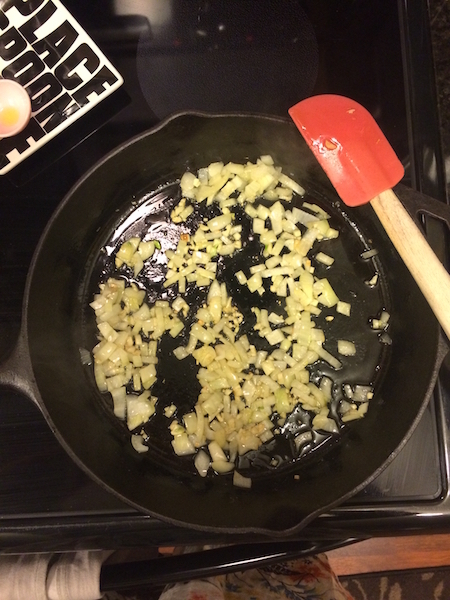 Chop 1/2 of a small yellow onion and mince 3 cloves of garlic; combine into a small bowl and set aside. Wash 1 cup of baby tomatoes, then cut them in half and set aside. 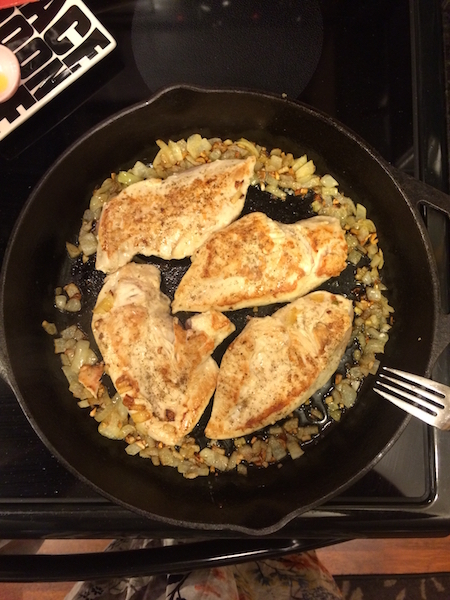 Heat oven-safe skillet (I like cast iron) or your frying pan to medium and add the olive oil. Add onion and garlic, cook until soft & browned, about 5 minutes. Next season the chicken with salt and pepper. 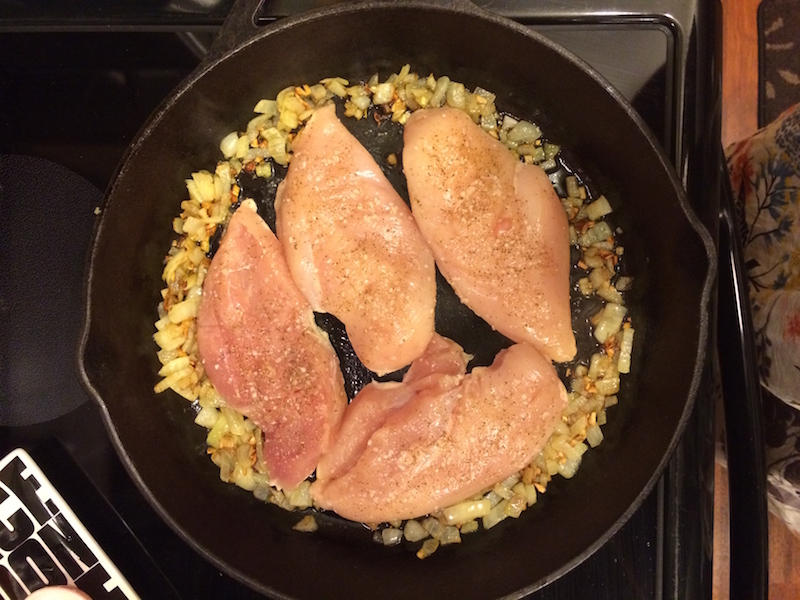 Then, push the onion and garlic to the sides of the skillet and add the chicken, cooking each side of the chicken breast for 5 minutes. 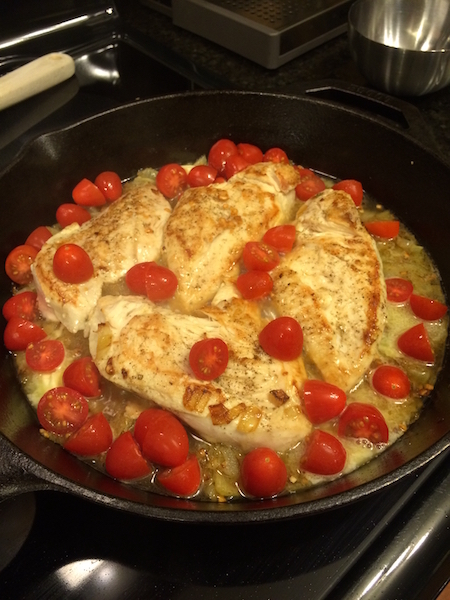 After the second side is cooked, add the chicken stock, butter and tomatoes and simmer in the pan for 5 minutes. 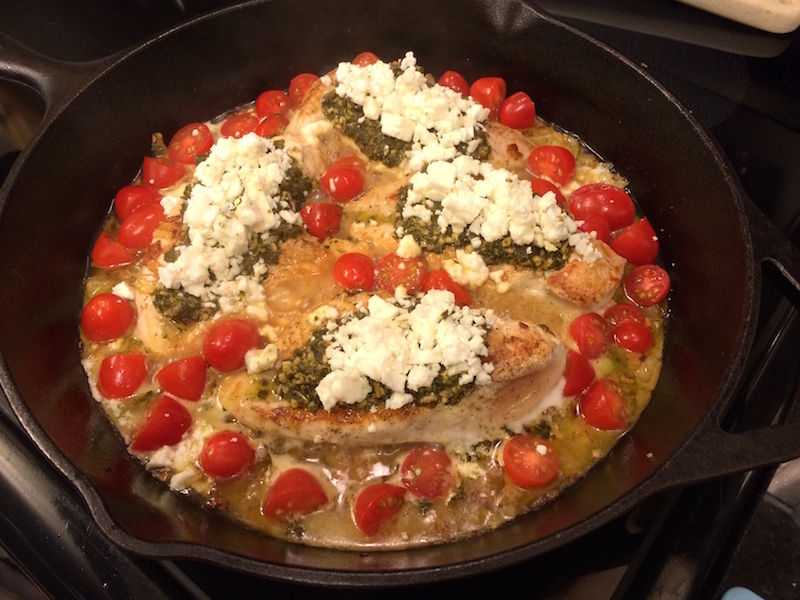 Then, spread 1 tbsp of pesto on top of each chicken breast and then top off each with the crumbled feta (dividing the feta between the 4 chicken breasts). Cover the skillet or baking dish with foil and bake in the oven for 15 minutes. Take the pan out and let cool a couple of minutes before serving. I love serving this with a side of quinoa or rice and green veggies like sautéed kale or broccoli. PLUS this makes excellent leftovers! Make sure to check out Cooking in My Genes website, Facebook, Instagram, Pinterest, and Twitter. 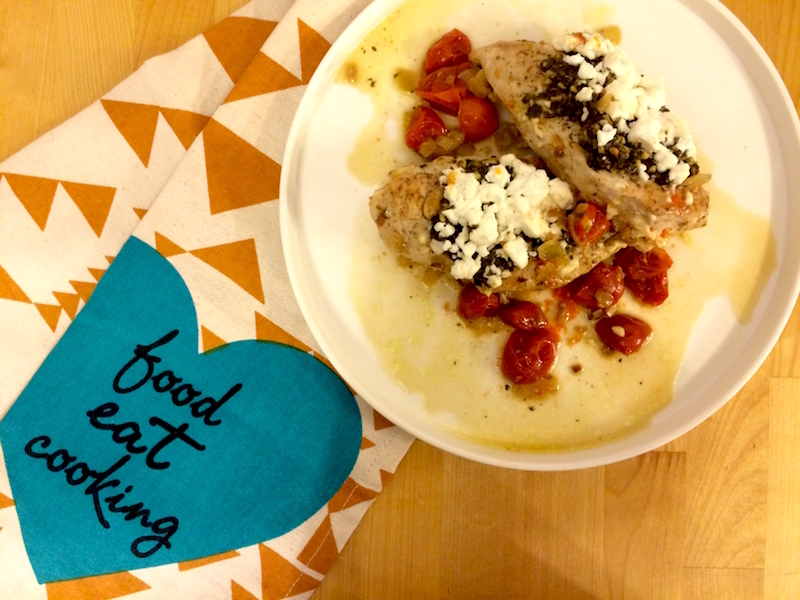 This entry was posted in Food and tagged chicken, dinner, feta, food, recipe, tasty tuesday, tomato.